Turn your heaters on full heat whilst you use the below methods for defrosting. This will help speed up the process and make your car nice and warm once you’re finished. Leave your car running unattended to let it defrost, this leads you vulnerable to theft which may not be covered by your insurance. Your vehicle could also injure passers-by. 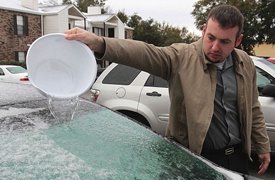 People often use warm water to defrost ice from their windshield. 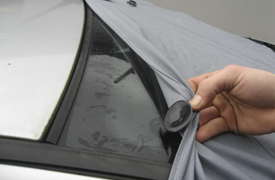 Provided the ice isn’t too thick this could be a fast and easy way to defrost your windscreens. On extremely cold days this method won’t be as effective as the water will very quickly cool and could even cause even more ice to build up. You’ve probably heard that you should never use boiling water on your frozen car. This is because the sudden change in temperature could cause the glass to break or serious damage to your car’s bodywork. One of the most fool proof methods is to plan in advance and cover your windows the night before you’re expecting frost. You can use towels, sheets or specially made window covers to cover the glass which will help prevent the build up of ice or frost. Make sure the cover is spread tight against the glass and ideally shut the corners into the door frame to keep them in place. You may still find you need to scrape off some small build ups of ice but generally the glass should be ice free. Although de-icer can be expensive it is often the most effective method of removing ice build ups from your car. 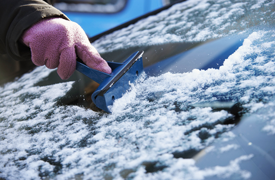 Depending on the the thickness of the ice you might be best scraping off some of the excess before you apply de-icer, this will make your de-icer last much longer as there’ll be less ice for it to melt.